A real warning to all of you that come to view wildlife in its natural surroundings. Respect their space and zoom in with your lens instead of vehicle or boat! 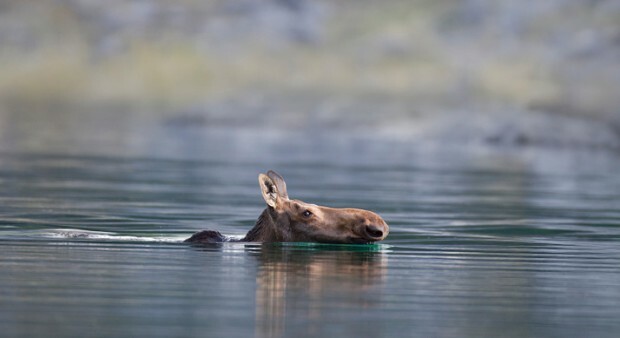 Two boaters have been fined a total of $2,500 for harassing a cow moose swimming in a northwestern Ontario lake. A Dryden man and his Albertan relative both pleaded guilty to the offence in Ontario Court of Justice and the boat has been seized. Ontario’s Ministry of Natural Resources said it received complaints about boaters harassing a swimming moose in Eagle Lake in Dryden on July 29, 2013. Court heard that conservation officers responded to the scene in Outlet Bay of Eagle Lake, where witnesses provided a video showing a boat circling a swimming moose. After circling the moose, the boat went to shore and returned with three other adult passengers. The boat repeatedly drove in tight circles around the swimming moose, preventing it from going to shore and then a passenger jumped out of the boat and onto the back of the swimming moose. The man was on the moose “a couple seconds” before the animal bolted into the woods, said Michael Prepp, an enforcement manager with the MNR. There’s no indication the moose was hurt, Prepp noted on Tuesday, Oct. 1 in a phone interview from Dryden. “We think that it got away and that it was fine,” he said. The boat will be returned to its owner once the fine is paid. The MNR says moose populations are carefully managed in the province and some are under pressure across many parts of northwestern Ontario. Moose will try to escape from predators, including humans, the ministry says, adding that a moose that cannot escape an attack can suffer extreme physical exhaustion and stress, including death.